﻿Freedom of speech is defined as, ?the right to express any opinion in public without censorship or restraint by the government?, and Article 35 of the Chinese constitution promises the right to "freedom of speech, of the press, of assembly, of association, of procession and of demonstration." (China.org, 1982) I am going to explore this question focusing solely on how governmental censorship of the internet and media limits free speech for people in China today, and the impact that this has. Although there are many other aspects of this broad topic, namely Tibetan protests, I cannot explore them all in such a short discussion. I will then analyze freedom of speech comparatively to the United Kingdom, and show that although freedom of speech is welcomed there are still restrictions, as there are in any country, and the ramifications are frequently negative. I will argue how I believe that the degree of freedom of speech for people in China is dependent on their demographic and job. I will also argue how restricting freedom of speech is not necessarily a sinister objective. Therefore, although there are limits on freedom of speech for people in China today, these limitations are only felt by particular segments of society at a time, and have been shown to have positive consequences comparatively. To begin, there are over 1 billion people in China, 384 million of whom were internet users by 2009 (Xiao, 2011), primarily those in urban China. Freedom of speech via the internet has many limitations, as I will explain. Censorship has been defined as, ?the act of changing or suppressing speech or writing that is considered subversive of the common good.? The ?Great Firewall of China? is a well-known, sophisticated filtration system that has been in place since 1995 when the internet first became commercially available to people in China. The rules that have been created from 1995 to the present have been implemented to control and supervise nearly all aspects of the internet. ...read more. It is compulsory to have a license, which is granted by the state, and so not adhering to these rules can lead to licenses being revoked by the Central Propaganda Department, the main regulatory body. In the same way, they can shut down media websites if they feel that the publishing is somehow damaging to China in any way, for example in 2012, Bloomberg and New York Times were blacked out because they ran stories on the personal wealth of Xi Jinping and Wenjaboo (Council on Foreign Relations, 2013). It is journalists, however, who arguably have their freedom of speech oppressed the most. For example, journalists will not be paid until their work has been checked and published which acts as a huge disincentive to not follow the ?main melody? of the party. In addition, journalists can face reprisals at work, fines and imprisonment, with Reporters Without Borders estimating that in 2011 alone 27 journalists were imprisoned, one being Tan Zuoren who was ?sentenced to 5 years imprisonment for drawing attention to government corruption and poor construction of schools after the 2008 earthquake in Sichuan province? (Council on Foreign Relations, 2013). For the CCP, media is the ?mouthpiece of the party? 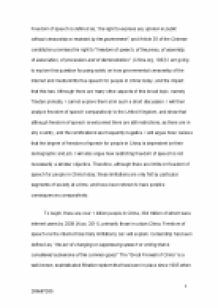 (Xiao, 2011) and is there to propagate positive views of the party. For example, there are often photos and videos of party officials shaking hands, and news comparing the growth of their economy with other countries, particularly the west. At the same time, the CCP selectively chooses which negative press to block or allow, so as to not create social unrest, although this too limits the news that journalists are able to cover. If we take the Tiananmen Square massacre of 1989, for example, media coverage and access to internet information was essentially banned, meaning that neither journalists or ordinary citizens could voice their opinions or find out more information regarding the incident. ...read more. For these reasons, I believe that the controls and measures put in place by the CCP to minimize freedom of speech work in favour of both the people and themselves. It is also true that this increased freedom of speech does not necessarily lead to greater democracy or unrestricted human rights; therefore, even though Western society may enjoy greater freedom of speech, the CCP?s implementation of such restrictions has so far been successful in creating political and social stability. When considering how much freedom of speech people in China have, it is clear that they have less freedoms than those in the UK, but it begs the question whether even political activists in China would opt for a system where society is unstable and frequently hostile. 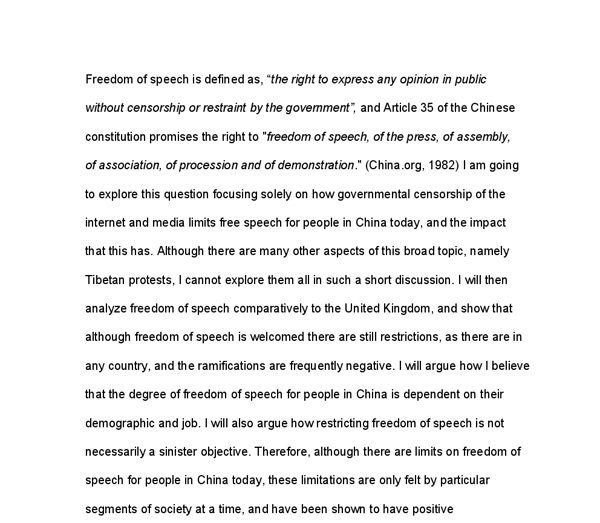 To conclude, the aforementioned points outline the degree to which I believe people in China have freedom of speech. I believe that the internet and the media are the greatest limitations to the free speech of Chinese people, and comparatively to the UK, Chinese people have far less freedom of speech. However, as I have also outlined, the impact that this has on freedom of speech is not as great as it may appear; the affects are mainly felt by metropolitan people. There are still many people in China that do not have access to the internet, media legislation only affects a small, working minority, and comparatively other countries have not seen political or social stability through executing their freedom of speech. In any case, freedom of speech is limited in all countries, but in a much more subtle way. The Chinese Communist Party are trying to stabilize their country and keep the citizens happy which, I believe, has taken place. For these reasons I have spoken about in my short discussion, I believe that the breakdown of freedom of speech, although existing, only impacts particular segments of society at a time and overall consequences have been positive; it would be false to say that people in China today have no freedom of speech. ...read more. MARRIAGE * The cooked yam a couple receives prior to their marriage marks the beginning of their future marriage which will revolve around yam production. The wife's parents would present large amounts of raw yams following the cooked yams. Cialdini and other researchers in 1976 also demonstrated this theory with their study amongst college football supporters. They found out that after a match; if their team won, they would be highly likely to wear college insignia and apparel. Though this was a long strained period for the suicide of teenagers, they did decrease soon afterwards. Even though the rates in 1990 were very high, they decreased from that year to 2003. From 1950 to 1990 the rates of teenagers between the ages of 15 and 19 had increase by 300%. Buddhism is the most widespread religion and therefore Buddhism temples and towers can be found all over China. On selected spaces it was built a miniature imitation of the nature, where body and mind could relax. Emperors had their own gardens where they beside relax also handled state affairs, amused themselves or hold religious ceremonies. Women felt withdrawn by men in the fact that they could not learn. Women were finally allowed to learn and this is again because they fought for their rights. In the 1800s women kept finding more success and kept pressing themselves for more quality and freedom. It is more risky to abort rather than give birth. Many abortions lead to complications, especially illegal abortions. When women go through these illegal abortions, the chance is high that they will receive serious side effects, the most common being heavy bleeding. These abortions are unsafe to the mother?s health. Lastly, the wealthy Roma gypsies share the value of not believing in moderation with the Visigoths. Postman contrasted the values of the Athenians and of the Visigoths in his essay. He said that the Athenians believed in beauty and moderation, which would imply that the Visigoths did not value those things.